Georgia is a small country in Eastern Europe. Set on the coast of the Black Sea, it lies to the south of Russia and to the north of Turkey, Azerbaijan and Armenia. The capital city is Tbilisi and the currency used in Georgia is the Lari. Georgia was part of the Soviet Union until 1991. Since 1999, Georgia is a member of the Council of Europe, but it has not joined the European Union. From the early 19th century Georgia was part of the Russian Empire. Georgia was made a part of the USSR, also known as the Soviet Union, in 1922. 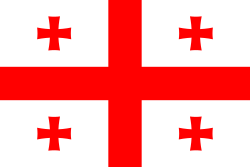 After Georgia gained independence from the USSR in 1991 it had a civil war which lasted for 3 years and was caused by a power struggle between different people who wanted to govern Georgia. Soon after further violence occurred in the Georgian regions of Abkhazia and South Ossetia which had large populations of Russians who either wanted to become independent or part of Russia. Since the 1990s both regions more-or-less govern themselves although they are not recognized as independent countries by most other countries. In 2008 there was a major war between Georgia, Russia and fighters from Abkhazia and South Ossetia (2008 South Ossetia war). Russia bombed Georgia and invaded parts of the country before pulling out shortly after. Both regions continue to govern themselves although the Georgian government still insists that they are part of Georgia. The Likani Palace from the Kura River, Borjomi, Georgia. Georgia covers an area of about 69,700 km2 (about 26,900 sq mi). It is bounded by Russia on the north and by Azerbaijan, Armenia, and Turkey on the south. Rugged mountains make up about 85 percent of the total land area. The coastal area of Georgia has hot summers and cold winters while the mountain areas of Georgia have cool summers and rainy winters. Georgia is a very mountainous country with many mountains over 4,000 metres high. The highest mountain in the country is Shkhara at 5,068 metres. Georgia is also home to many deep caves including Krubera Cave which is the world's deepest cave at over 2,000 metres deep. Georgia's Black Sea coast is full of sandy beaches and popular with tourists from the region and elsewhere. The population of Georgia is 4,646,003. Nearly 100 different ethnic groups make up Georgia's population. Georgians are the largest group, making up about 70 percent of the population, followed by Armenians, Russians, and Azerbaijanis. Georgian has been the country's official language since 1918. Russian is also a commonly spoken language. Education is free and required from the first grade to the eleventh grade. Georgia has an adult literacy rate of 99.5 percent. The majority of people are Christian. Each year Georgia is becoming more and more popular for international tourists. Ancient cathedrals and monasteries including Svetitskhoveli Cathedral, the architecture of Tbilisi's old town, traditional cuisine and fine wines are popular attractions for visitors. Over 25% of Georgia's territory is designated as national park and forests cover 40% of the total area. Around 3 million foreign visitors enter the country every year. There are 4 UNESCO World Heritage Sites in Georgia which are: Bagrati Cathedral, monuments in Mtskheta (including the cathedral in the picture on the left) and the Upper Svaneti ruins.